A fresh concept in the art of boxing simulation "Boxerjocks"® A game of skill as well as an exciting thrill ride all rolled into one. Each rider enters the Boxerjock to find himself encased in a suit of steel armor ready to do battle. Totally safe and easily operated by riders of all ages. 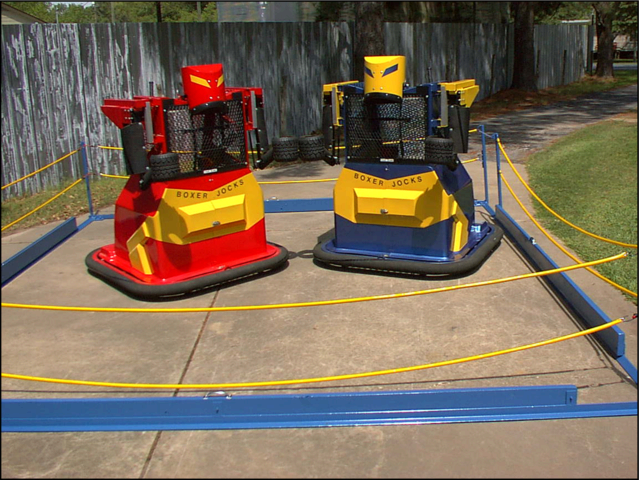 Complete maneuverability allows strategic positioning of each robot via dual joystick control. Punch-buttons located upon each joystick allow the rider to punch at will either arm. A digital display keeps the tally of each riders score as the match continues until a victor, who gains the highest offensive score, wins the match!